Someone else was supposed to write this review, but I am going to try and give it a shot. 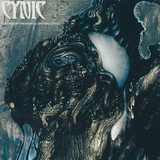 I dare saying that there is no other band in the history of various metal genres whose one album stirred up so much intrigue as Cynic’s Focus almost 20 years ago. The progressive death displayed on that album granted the band a legendary status, so when Cynic reunited a few years ago the expectations were running sky high. As many progressive true artists do, Cynic did not stand idle for almost twenty years and reunification happened to showcase a completely different entity on Traced in Air, one with only hints of the deathly past, yet steeped in intricate musicianship influenced by the vastness of world music. Another EP between now and then, Carbon-Based Anatomy takes Cynic on a further evolutional spiral. Whether it is the line of progression set out on Traced in Air, or another parallel universe, the music experts will be able to decipher. I do not know enough of music theory to tell you which musical influences dominate Cynic’s thinking these days. Several things are certain, however, the band is not going back into their past and Carbon-Based Anatomy has even less to do with the standard notion of “metal” than Traced in Air did. If you are ever to attend a party full of discerning liberal minded music fans, who are self-professed at world music knowledge feel free to play Carbon-Based Anatomy for them. Cynic would not have you embarrassed. Then play Focus in quick succession to see their jaws drop to the ground, to provide evidence that technical death metal players can have enough wherewithal and subtlety to be able to go on the intricate journeys which are the tracks on Carbon-Based Anatomy. Because this EP is a further foray into the world music supported by superb percussive framework and a slight hint of heaviness. The transitional connecting tracks of Carbon-Based Anatomy are pure earthy fabric, the native American soothing Amidst the Coals (the Sacred Spirits of Yeha-Noha are calling here) or the Caribbean/African/wherever else from Planet Earth these sounds can come from Bija! The title track and Box Up My Bones, the two favorites of mine here, are complex kaleidoscopic pictures, with rolling and steadying percussion, growing and fading melodies with the special emphasis on beautiful multilayered vocals representing those voices of the world. Elves Beam Out is more astral and shimmering, takes flight away from earthly matters for a while, yet still comes back down to the surface eventually. Not something that can be ascribed a ‘catchy’ label, definitely not from the first several go-rounds, Carbon-Based Anatomy is better left playing constantly, on the repeating loop. The compositions do eventually click and display new facets, ultimately making sense. You can use this EP for your deep personal enjoyment, or for that superficial showcase of “sophistication” if attending any of the aforementioned environmentalist/green party gatherings. As usual, to each his own.